ECB President Mario Draghi and the bank's other policy makers kept interest rates at record low levels Thursday. The European Central Bank kept interest rates at a record low of 0.75% on Thursday in the absence of hard evidence that the eurozone recession is deepening and as inflation remains above its target. The bank said in December it expects the eurozone economy to contract by 0.3% in 2013, after the region fell back into recession in the third quarter of 2012. But recent survey data suggest business confidence is recovering slowly despite signs that core countries such as Germany are suffering. And inflation, while falling, remains above the ECB's target of just under 2%. 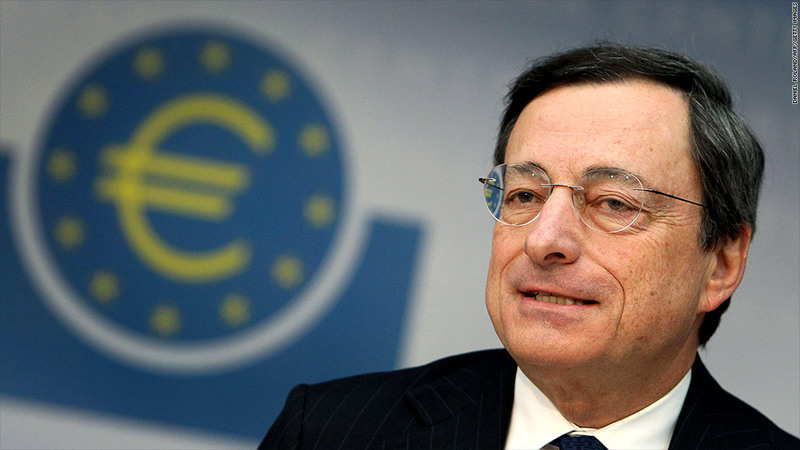 "The decision was unanimous," ECB President Mario Draghi said at a news conference after Thursday's meeting. "If you look at the overall landscape... you see a significant improvement in financial market conditions and a broad stabilization of some [economic] indicators." Draghi cited rising stock and bond markets, strong capital inflows and a reduction in net loan redemptions in the eurozone, but acknowledged that the economy remained weak and would remain so at least for the first half of this year. European equity markets have continued to rally this year and bond yields in weaker eurozone states have fallen. Spain, which is relying on the European Union to bail out its troubled banks, sold more bonds than expected Thursday as it began a demanding borrowing program for 2013. Yields on Spain's benchmark 10-year bond dropped below 5% for the first time since last March. Draghi said the biggest risk to the economic outlook stemmed from a lack of action by European political leaders, particularly in the area of structural reforms to improve the region's competitiveness. Much progress had been made in terms of fiscal reforms, but it would be wrong to ease off the gas now, he added. Earlier, the Bank of England also held interest rates at a record low of 0.5%, and did not add to its quantitative easing target of £375 billion ($600 billion). The decisions were in line with market expectations and reflect a desire by the bank to give its Funding for Lending program -- a way of providing cheap funding for banks to lend to businesses -- more time to work through the economy. There are signs that the program is already making it easier for companies to borrow. BoE officials are also wary of easing policy further while inflation remains significantly above the bank's target of 2%, despite evidence that subdued consumer spending, difficult export conditions and the government's austerity drive may have pushed the economy backwards in the fourth quarter. Some economists say U.K. conditions may warrant further easing later this year, particularly if the country falls into recession for a third time since the financial crisis. That would present a challenge for incoming governor Mark Carney, who is due to succeed Mervyn King in July. "Adding to [quantitative easing] should only be considered if new threats emerge to the stability of the U.K. banking system," said David Kern, chief economist at the British Chambers of Commerce, which represents over 100,000 businesses in the U.K.
"We believe that further QE (quantitative easing) would provide only marginal benefits for the real economy, while heightening longer-term risks of financial distortions, bubbles and higher inflation," he added. Draghi said the ECB was monitoring signs of "exuberance" reflected in overvalued private equity deals and leveraged buyouts, but said the risks were contained at present.